Diamond Peak launched its new website in December 2013; it recently won three gold ADDY awards for Northern Nevada. 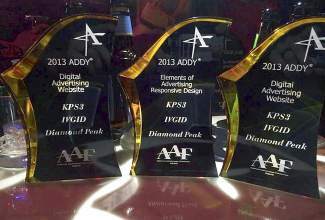 Diamond Peak Ski Resort recently was awarded three gold ADDY awards for its new website, DiamondPeak.com. The site, designed and developed by KPS3 Marketing, was honored in categories of consumer website, mobile website and responsive website design. The ADDY Awards is a national advertising competition with over 5 million entries annually. Every year, 60,000 entries are submitted in local competitions. This local competition, covering the Northern Nevada market, is hosted by the local chapter of the American Advertising Federation, Reno’s professional advertising association. Entrants are judged on creativity in the art of advertising, and the ADDY Awards are regarded as the advertising industry’s largest and most representative competition. The Diamond Peak website will now move on to compete at the district level along with Northern California gold ADDY winners. DiamondPeak.com incorporates the latest in responsive design techniques, seamlessly providing design and layout that is suited to any screen size from desktop to tablet to mobile phone. The multi-level push navigation on mobile devices allows users to reach any of the site content with the same ease as the desktop experience. For more information, visit DiamondPeak.com or call 775-832–1177.